After its official Worldwide launch at the Bangkok Motor Show on 24th March, next year's new Ford Ranger is being revealed to British customers at the somewhat less glamourous Commercial Vehicle Show in the National Exhibition Centre, Birmingham. New from the ground up – with everything changed except its name – the new Ranger has been engineered match the slogan "Ford Builds Tough", together with increased loading capability, improved performance and economy, enhanced comfort and safety, smarter technology and a tough new look. The all-new Ranger is the first commercial vehicle to be built under the One Ford strategy as part of a global product programme, bringing together the full engineering expertise of Ford around the world. Developed in Australia, it will be produced in Thailand, South Africa and Argentina for sale in more than 180 markets worldwide. UK Rangers will come from South Africa, not Thailand. New Ranger will be offered as a complete family of pick-up models with a choice of three versatile cab body styles – Single Cab, RAP (Rear Access Panel) Cab and Double Cab – along with the option of 4x2 and 4x4 drivetrains, two ride heights and up to five series choices to suit every pocket and market. European customers will have a choice of two new state-of-the-art Ford Duratorq TDCi diesels which deliver improved power, torque and fuel efficiency: 2.2-litre (150PS and 375Nm) and 3.2-litre (200PS and 470Nm). With its very strong high-strength steel passenger cell structure and advanced restraint systems – including new side curtain airbags and thorax-protecting front-seat side airbags fitted as standard across all cab styles in Europe – the all-new Ranger has been engineered to deliver class-leading safety performance. The new model also utilises Hill Launch Assist, Hill Descent Control, and a carefully tuned Electronic Stability Program (ESP) system to help the vehicle keep its wheels sturdily planted on the road under all conditions. "Since it was introduced to Europe in 1997, the Ford Ranger has established itself as a major player in the European pick-up segment," said Jesus Alonso, Ford of Europe's director for Commercial Vehicle Marketing, Sales and Service. "This all-new model will reinforce the reputation of the Ranger brand with its bold new appearance, improved depth of capability for hard working businesses, and new levels of comfort, technology and safety. And with a significantly improved fuel economy this new vehicle offers both low cost of ownership and sustainability benefits. We are starting a new chapter in the Ranger success story." The all-new Ranger is immediately recognisable from its bold new exterior style, which its designers have named "21st Century Tough". Designers raised the beltline significantly, along with the rails of the load box, giving the Ranger a substantive presence on the road while increasing its functionality with the deeper box.At 5,359mm long and 1,850mm wide, the new model is 279mm longer and 62mm wider than the outgoing model, benefitting both interior space and load capacity. For customers seeking a ruggedly stylish and supremely functional lifestyle vehicle, the Wildtrak version takes Ranger's sporty appearance even further, with a unique colour split on the front. Ford’s new Ranger will be offered in a choice of three cab body styles – Single Cab, RAP Cab and Double Cab – to suit the diverse needs of pick-up customers. All three cab styles are among the roomiest in the segment. With a completely new interior design, the Ranger offers a contemporary look and feel with features and comfort normally found only in passenger cars. The bold graphics of the interior surfaces are finished with materials that will stand up to the demands of a workhorse while delivering a lasting quality appearance. From the no-fuss vinyl seats of the base series to the cloth trim and leather option of the higher series, all materials used in the new Ranger were subjected to heavy-duty testing for commercial vehicle use. The dynamic Wildtrak model features unique materials and finishes, including seat trim inspired by sportswear which combines leather and woven cloth. Contrast stitching and a discreet strip on the seat upper and bolster, all in distinctive Wildtrak Orange, accentuate the premium feel of the interior. Making full use of the spacious interior, the Ranger Double Cab offers 23 storage spaces in the cabin – more practical stowage than any competitor. Its deep centre console bin is the biggest in its class at 8.5 litres and can keep up to six cans of beverage cool in models with a duct from the air-conditioner. The glove box is large enough to accommodate a 16-in laptop computer while door pockets can comfortably fit 1.5-litre water bottles. Ample storage for mobile phones and other small items can be found in the console and in areas within easy reach of the driver. Underneath the rear seats, a convenient hidden storage area for tools can easily be accessed. Poised to be a leader in innovation, the all-new Ranger comes loaded with smart technologies that make the pick-up easier, safer and more fun to drive. Selected models offer Bluetooth® audio streaming, USB and iPod connectivity, together with voice control over the radio, CD, iPod, USB, air-conditioning and mobile phone (with software that recognises English, Spanish, French, German, Italian, Portuguese and Turkish). Dual-zone climate control and cruise control are available on the high series while selected models offer a five-inch colour screen with satellite navigation. The Ranger is also the first vehicle in the segment to offer a Rear View Camera system. This system which displays the camera image in a section of the rear view mirror when reverse gear is selected dramatically improves visibility of objects behind the truck and also simplifies hooking up a trailer. Marker lines superimposed on the camera image help drivers reverse even more safely and accurately, showing the path of the vehicle based on the current steering angle. Two yellow lines indicate the total width of the pick-up, along with additional coloured bars that signpost distances of 0.3 metres, one metre and two metres. A black dotted line that marks the pick-up’s centre line assists the driver in lining up a tow hook with a caravan or trailer. Ranger customers in Europe will have a choice of two new state-of-the-art common-rail Ford Duratorq TDCi diesels which serve up exceptional performance with more power and torque, while also delivering outstanding fuel efficiency. The two new diesel engines feature numerous refinements, including the implementation of the latest high-pressure common rail fuel injection systems. The injection systems have been precisely tailored and calibrated for outstanding combustion efficiency, achieving excellent fuel economy ratings while meeting the most stringent exhaust emissions standards. The 150PS 2.2-litre four-cylinder diesel engine replaces the previous 2.5-litre unit in the Ranger line up, and with a substantial 375Nm of torque offers over 13 per cent more pulling power. When fitted to a 4x2 model, it consumes as little as 7.6 L/100 km (37.2 mpg)* in the combined cycle – a reduction in fuel consumption of over 10 per cent compared to the previous model – making it one of the most fuel-efficient pick-ups in the segment. The formidable new 200PS 3.2-litre five-cylinder diesel engine delivers a stump-pulling 470Nm of torque, over 23 per cent more than the 3.0-litre engine it replaces. Its fuel consumption in a combined cycle is among the leaders in this area, ranging from 8.4 L/100 km (33.6mpg)* on a 4x2 variant to 9.6 L/100 km (29.4mpg)* on a full-option 4x4 model. With a generous 80-litre fuel tank, new Ranger also offers one of the longest ranges in its segment, with as much as 1,000km (620 miles) possible between fill-ups. The all-new Ranger breaks new ground by being available with a choice of advanced new six-speed transmissions, with both manual and automatic gearboxes being offered. These new six-speed transmissions offer significant benefits over the more traditional four and five speed alternatives, delivering increased fuel economy, greater responsiveness and enhanced refinement. The new six-speed automatic transmission has been extensively tuned to deliver smooth, quick shifts that are almost imperceptible to the driver, reinforcing new Ranger's car-like refinement. In Normal mode, the calibration focuses on comfort and fuel economy. For sportier driving, a quick flick of the shifter changes the transmission to Performance mode, providing later shift points and giving the driver the option to select gears manually through a forward (downshift) or rearward (upshift) movement. New Ranger also features smart Ford technologies such as Adaptive Automatic Mode, which adapts gear shifts according to driving style and Grade Control Logic, which automatically downshifts when driving downhill and the brake pedal is depressed. This feature prevents the transmission from changing to a higher gear. For those who prefer greater involvement, the six-speed manual transmission with its short, car-like shifter, provides crisp and precise shifting matched perfectly to the generous torque output of the new diesels. An upshift indicator in the instrument panel helps drivers select the best moment to change gear for optimum fuel economy. Maximising fuel economy was a key priority for the Ranger engineering team, and the new truck features a host of measures to eliminate any waste or inefficiency. 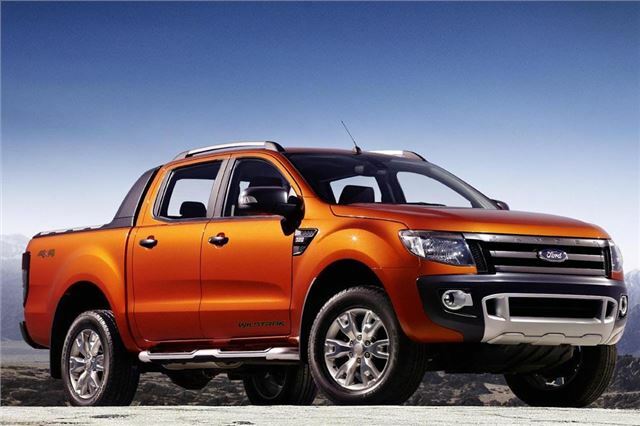 The aerodynamics of the Ranger’s body was rigorously optimised using cutting-edge simulation technology. Ford's aerodynamicists performed more than 1,000 full-vehicle aerodynamic simulations to minimise drag and deliver the most streamlined shape. Design refinements introduced to improve efficiency include the addition of a hard line at the fender top, a more vertical backlight position, an optimised A-pillar shape and a small spoiler added to the top of the tailgate. The shape of the front air dam also plays a significant role in controlling the airflow underneath the vehicle, and was optimised to achieve a significant reduction in drag. To make Ranger more efficient than ever, the engineers insisted on tyres offering the best rolling resistance but without compromising grip, ride and handling. The gear ratios and final drives were also meticulously matched to the engines to deliver maximum fuel economy while ensuring optimal performance, towing capability and payload capacity. The powertrains also feature a Smart Regenerative Charging system which increases the alternator output when the vehicle brakes or decelerates. This converts the kinetic energy of the vehicle into electric energy without having to use additional fuel. The ‘free’ electric current is used to recharge the battery, so that it can be used by the electrical systems at a later stage. Capable of handling even the most challenging topography, the drivetrains of the all-new Ranger have been extensively tested to ensure they offer optimum reliability and durability. Four-wheel-drive models are equipped with a well-proven electronically controlled transfer box – for both manual and automatic transmissions – that allows drivers to shift 'on the fly' from 4x2 to 4x4 anytime via a switch conveniently located on the console. If extra torque or additional downhill braking is needed, the driver has the option of selecting low-range. A variety of final drive ratios, from 3.31 to 5.3, will be available depending on the drive configuration and whether the vehicle is a low- or high-ride model. Although an independent vehicle safety assessment testing will not take place until later in 2011, Ford is forecasting that the all-new Ranger will be a leader in safety for its segment. 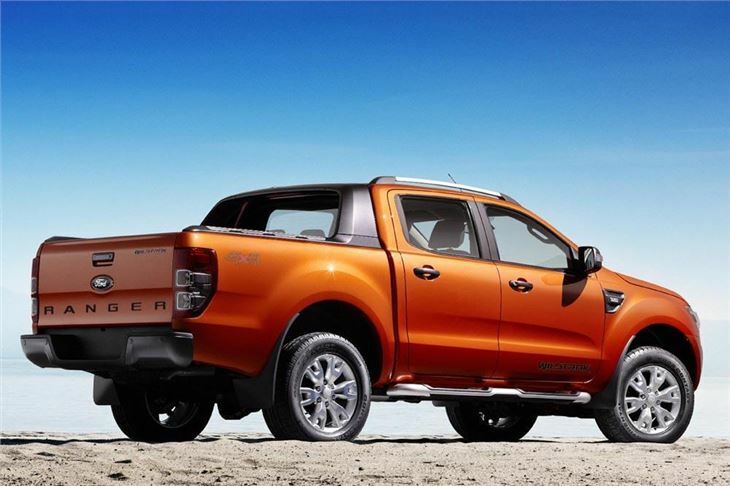 Like all contemporary Ford products, Ranger is engineered to provide comprehensive safety protection, starting with the highly protective body structure utilising high-strength steel throughout to protect occupants in a collision and the all-new frame that manages the brunt of crash energy. Engineers used sophisticated computer modelling to go through more than 9,000 full-vehicle crash simulations before the first prototype vehicle was subjected to a physical crash test. Standard on all cab styles in Europe for the first time, side curtain airbags deploy from the headliner to provide a protective cushion for the head of occupants in case of a side impact. The curtain is designed to protect both rows of occupants by covering the upper side structure and glass from the A-pillar to the C-pillar. New side airbags also deploy from the side bolster of the front seats to protect the thorax from side-impact forces, working in tandem with the front airbags for the driver and front passenger. Knee airbags are also standard across all models. Other passive safety technologies include three-point safety belts for all seating positions, with pre-tensioners and load limiter for the front seats, as well as Ford BeltMinder technology which helps remind front-seat occupants to wear their belts. On top of the passive safety technologies, the new Ranger has been engineered with the latest pedestrian protection features. Technologies that emerged from a global Ford research project on pedestrian-friendly vehicle designs have now been applied to a pick-up for the first time ever. This includes a “hexageneous” under-bonnet structure to reduce the potential for pedestrian head injuries, and a pedestrian-friendly front bumper design incorporating energy-absorbing materials. Other new Ranger technologies which aid the driver but can also help them avoid potential contact with pedestrians include Rear Park Assist and the advanced Rear View Camera System. The all-new Ranger also uses innovative active safety technologies to help drivers avoid accidents. A key component is the Electronic Stability Programme (ESP) which comes with a full suite of features that make driving the Ranger even safer in both on- and off-road conditions. The Trailer Sway Control system monitors the behaviour of the tow vehicle and trailer array to sense the advent of trailer sway and apply braking countermeasures to reduce its effects. Adaptive Load Control provides additional stability assurance for drivers dealing with heavy payloads. When driving downhill, Hill Descent Control ensures that the brakes will be applied to control the vehicle at a set speed. Or when stopping on a steep grade, Hill Launch Assist helps the driver to pull away confidently without creeping, even when fully laden. The Ranger's ESP system includes off-road logic which recognises when the pick-up is driven on rough roads and modifies the system to ensure the best balance between stability and timeliness of interventions. In 4x4 models, the ESP system can be partially switched off to disable over- and understeer control as well as engine torque reductions, while maintaining the brake intervention traction control. This setting is most suitable when driving through deep sand or extreme mud as vehicle momentum can be maintained whilst maximising available grip. The ESP can be switched to a second setting to further amend the ESP braking intervention that aids the initial pull away in snow and icy conditions. The all-new Ranger has been engineered with the largest brakes in its segment, resulting in a system which provides powerful braking performance with excellent fade resistance, even when driving with maximum payload. An array of braking technologies work together to ensure short stopping distance under all circumstances, such as the Anti-Lock Brake System (ABS), Emergency Brake Assist and Electronic Brake Force Distribution which maximises brake force used on the rear wheels as payload changes while maintaining optimal stability. During emergency braking, the hazard lights also come on to warn other motorists. The ABS system features a Gravel Road Logic which further improves stopping distances on loose surfaces such as unsealed roads. With an all-new chassis frame, front and rear suspension and steering system, the new Ranger promises car-like comfort, reduced steering effort, more precise handling and better on-road stability. Front and rear suspension designs are entirely new, for a smooth, firm and comfortable ride whatever the road conditions or the size of the payload. The front suspension features a coil-over-strut layout, with carefully optimised designs for the upper and lower wishbones, while the rear suspension is based on a rugged leaf spring design. Even on narrow city streets, the pick-up’s tight turning circle makes it easily manoeuvrable despite sitting on an increased wheelbase. The responsive rack-and-pinion power steering system requires just 3.5 turns lock-to-lock, for precise and nimble responses. The 4x4 Ranger features a higher frame height as standard, although the 4x2 version can also be specified as a Hi-Rider model which shares the same frame as the 4x4 model. Engineers have found ways to tuck key components out of harm’s way so that the all-new Ranger can perform on rough terrain. Its ground clearance of up to 241mm is enhanced by having the driveline components mounted above the frame rail so that items like the transfer case and oil pan are protected by strong crossmembers. To improve Ranger’s water-wading capability, the truck’s key electrical components and air inlets are strategically placed high in the engine compartment, enabling the pick-up to go deeper than any others. The 4x4 and 4x2 Hi-Rider models can wade through up to 800mm of water – a class-leading feature that will be welcomed by customers who need to ford rivers or floods. When the terrain gets really rough and Ranger is in four-wheel drive low gearing, it provides the driver with more control through the accelerator pedal, which becomes damped and less sensitive. This prevents unintentional acceleration due to the bouncing motion of the driver’s foot while moving over bumpy terrain. For more information regarding Ford’s products, please visit www.fordmotorcompany.com.